This Space Wolf successor chapter is a bit of a break from the conventional paint scheme. Granted he's a successor chapter for a friend of mine and we're really just looking at different color schemes for his Wolf army. 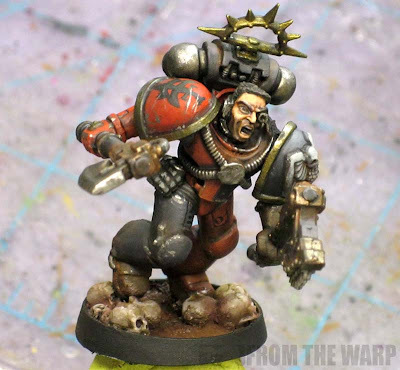 In some ways, he reminds me more of a Blood Angel successor chapter with the black and red than he does a Space Wolf. 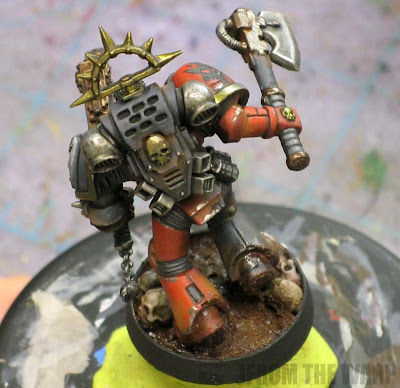 The idea with this guy was to do the classic quartered scheme and then really give him a weathered and beaten look. We chose the red and black since we've already gone through a number of other color schemes. I wanted to paint him up as a Pre-Heresy World Eater, but that got canned since it wouldn't have helped with picking out a usable scheme for his army. It's just the double axes look so cool. Since I couldn't go the World Eaters route, I had no choice but to embrace the black and red pattern. I kept everything toned down and used the red areas to add some life back into the color. I used a zenithal highlighting approach and made my highlights more pure in terms of color. I didn't add tons of color to this guy either. If I was left wondering what color something should be, I made it black. I did give both of his weapons some bronze using GW Tin Bitz. One, it gave me an excuse to use the color and two, it makes them look older and more archaic I think. Both perfectly good reasons in my book. This is what I am most proud of. This is my first time trying to do a "mud" base for a model. As I was building this guy, I had him on a standard flat base with some sand on top. I was focused more on the model than I was the base. Then when it came to weathering him, I sat there wondering what kind of world he was fighting on. 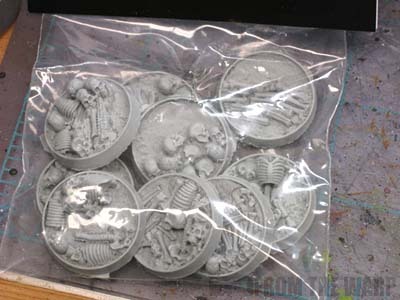 A while ago, I picked up some skull bases (they're actually called Bone Fields) from Secret Weapon Minis because I liked how they looked and even more than that, they reminded me of the Dark Angels Deathwing story where they liberate their homeworld from Genestealers. I will be putting a squad of Terminators on the 40mm bases I have. I knew I wanted something dark and miserable for this guy to be fighting in so I figured these might work. And it would give me a platform to work from for the weathering. If you don't know what kind of world your guys are fighting on, you can't really weather them properly. 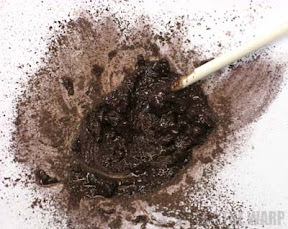 Not wanting to do another ash waste type look (although I will in the future), I decided to try my hand at making mud. I've never made it before, but I'd bought the kit to do this very thing such a long time ago that I had to go find all the pieces to it. It too came from Secret Weapon minis. Fortunately, I found the directions that came along with the materials otherwise I'd have been completely lost. Following the directions (yes, I do that sometimes) I made myself some mud. I got my ratios incorrect and made way more than I needed and it dried too fast for me. It does not take much powder to color the "mud." You also do not need much sand or plaster for texture either. I had too much of both. And you can't just keep adding the liquid water either because that just thins things out and you don't have mud anymore. I did find a happy medium and was able to apply a little bit of texture and some color. I wasn't going for trench type warfare although this would be the perfect way to get that effect. I was going more for it's been raining for a few days straight and everything is soaking wet now. You can see the base is recessed and is really designed to be able to hold any kind of "water." You can get and create a number of effects because of this. For me though, with this model, I just wanted to give it the wet look and have this guy slogging over a skull ridden muddy battlefield. I really like the effect. I used some of the dry powders after the mud had dried (it dries glossy due to the water effect used) to give the illusion of mud that had dried on his armour. The dry powders are slightly lighter than the "wet" mud and gives the illusion of layers that have built up on his armour. I didn't use much mud because I was using a few other effects like the chipped and scratched paint and dirt buildup in recessed areas of his armour. I did add some rust to his weapon and metal areas to show the dampness of the environment already taking it's toll on his equipment. Of all the color schemes we've done for his army, I think I like this one the best. Of course it's got the most work into it as well so that might be the reason. I'd like to think I'm starting to get the hang of weathering and finding the balance between all the techniques that can be used. I definitely wish that GW did recessed bases. The Warmachine ones were a joy to use in that regard. That is some great looking mud there Ron. I bet it would look great on some vehicle tracks. Mud seems like one of those techniques that you have to try a few times before you settle on the method or look that you like the most. This was a quick attempt at it, but I can certainly see that with some experimenting, you can get some killer looks. The mini looks great and the mud base really fits the weathered look. I have to say I love the line "I finally found a happy medium" in this blog... it seems like a bit of a pun when you look at it just right. As usual, it looks fantastic! 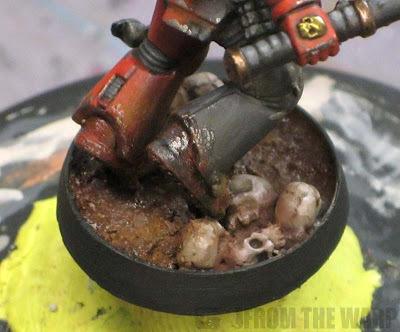 Quick question: from what I understand, weathering powders can be prone to rubbing off unless they are held in place with a sealant coat like a varnish. Did you do any such thing, or is this a 'display-only' model? The Inner Geek: Even that one missed me when I was typing it up. Although it made me chuckle when I went back and read it again. Anon: Thanks and yes it is true. Handling can rub them off if you're not careful. A form of sealant is the best route to go if you plan on using them for playing. I did not do it here though. This was a test model and I don't varnish models anymore as a matter of practice. I don't want to ruin the work I do for other folks. I leave it up to them to varnish the models once they get them. The weathering on the armor looks great! 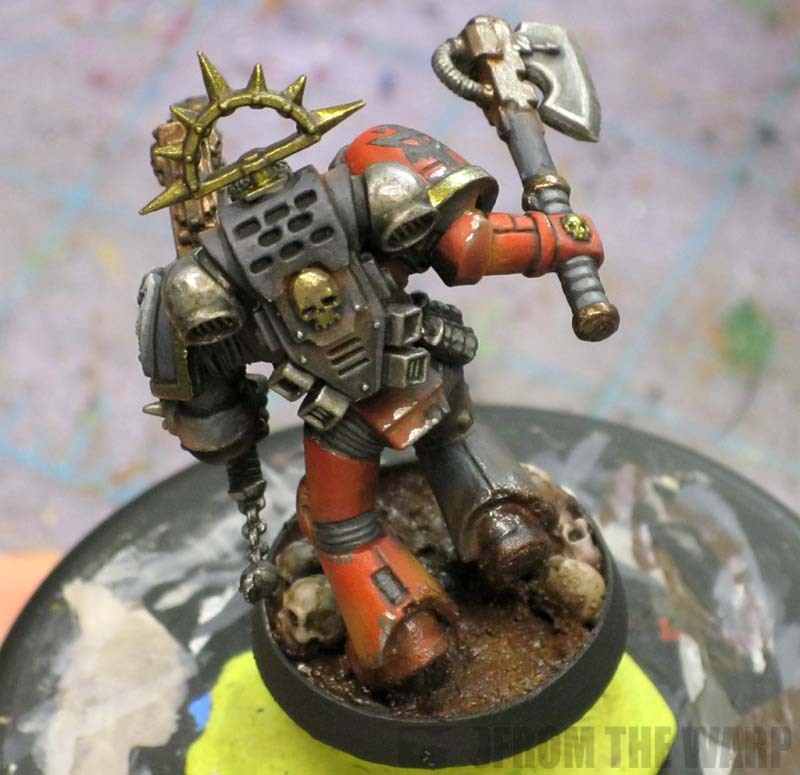 I'd like to see a Blood Angel done up like that. 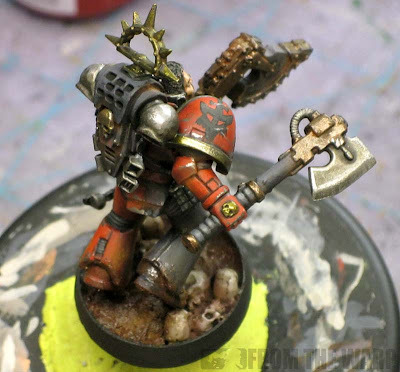 Looks awesome and more gritty which is how I think the Blood Angels should be. Not wearing all shiny armor that looks like it just came off of the assembly line. Harrower: Thanks. I deliberately went heavy on the weathering on this guy for a couple reasons. Mostly it was an experiment for myself in trying new things... I just happened to hide it under the disguise of doing a model for my friend. As far as a Blood Angel, we'll see. Maybe I can find a model to paint up in the classic color scheme. I wonder if you'd be better off mixing up some brown paint, white glue and baking soda for the mud instead? @Wesley: Nope, not at all. Unless you really, really, REALLY! blend the pigments they remain separated a bit in the mix - which means you get a more realistic, variegated look. Using paint gives you the look of having used thick paint -- which is really good as a base for ground work (especially if you mix it with Celluclay for that) but for mud you can't beat this method. To tone down the wet look Ron simply needed to use a bit less realistic water and a PINCH more plaster. Wesley: I thought about that, but decided to use the kit as it came. I had a similar experience with snow effects a while back. I tried using the puffy paint that kids use on tshirts to make bubble letters to simulate snow. While it works, it just doesn't have the same effect or realistic look that using the hobby stuff does that you apply over glue. In the end it's a balance between the look you want and the amount you have to spend on all the little extras. Somewhere in there is a balance. Ron, if you need a model I'll gladly donate one so I can see it all painted up! The Harrower: Thanks, but let me see what I have lying around here... I may have a spare Terminator I can use. That thing is one of the rare occasions when GW say that there are none possible apart from the infamous Wolf Brothers. Aeteros: The power of a DIY chapter. You use the rules from the Codex you feel best suits the chapter you have imagined in your head. There's a lot to be said for that kind of freedom in designing a chapter. absolutely spot on with the colour scheme and the split pattern. Would love to see a break down on how you painted the grey and the red.